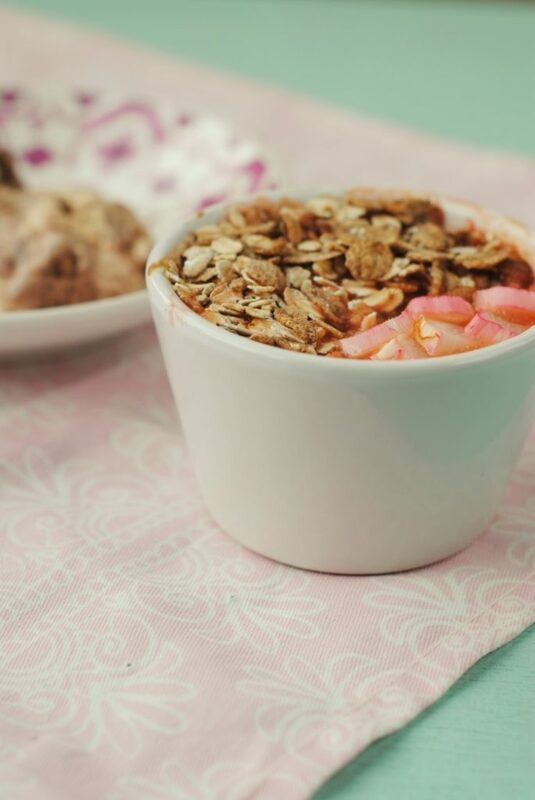 Rhubarb is a classic British ingredient and chances are, if you went to school in the UK then you will have fond memories of some kind of rhubarb dessert. 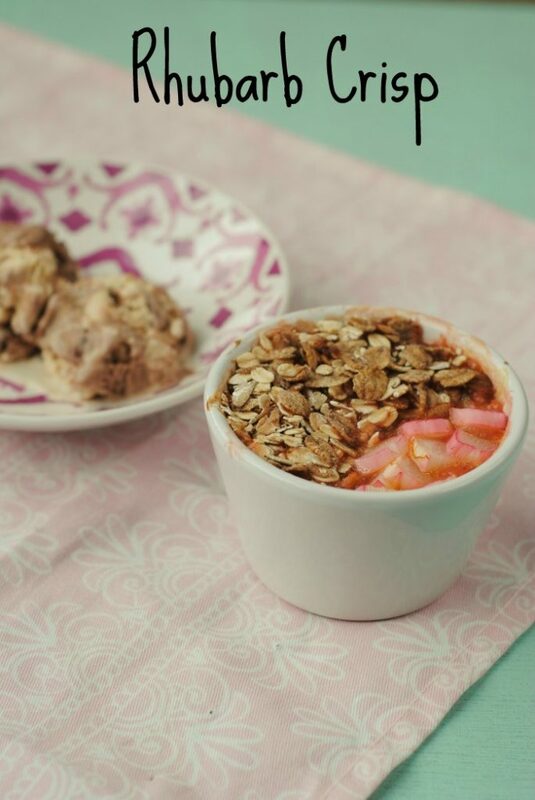 Rhubarb Crisp is my favourite way to use rhubarb in a dessert, without it being too high in calories or fat. Hooray! We have a dessert recipe! I mean, we all love dinner, but we are just getting through it to get to dessert, right? Like when we were kids, “you can’t have dessert until you finish all your dinner”. There have been a lot of main meal recipes on the blog recently, so let’s indulge in a little dessert shall we? Grab a spoon, put your feet up and let’s watch some TV! If you want to be kept up to date on my new healthy and delicious recipes like this, then please subscribe to the blog mailing list (it takes 30 seconds) and you will get sent the new recipes straight to your inbox. Your email address won’t be passed on to anyone and you will never be spammed. Click here to sign up. Yesterday I spoke about a recipe that reminded me of my Mum, and I shared my Lentil Bolognese recipe, well today’s recipe is thanks to my Nan as I grew up with her making her rhubarb crumble. This recipe doesn’t even come close to being as good as hers, but it is my healthier version of it. 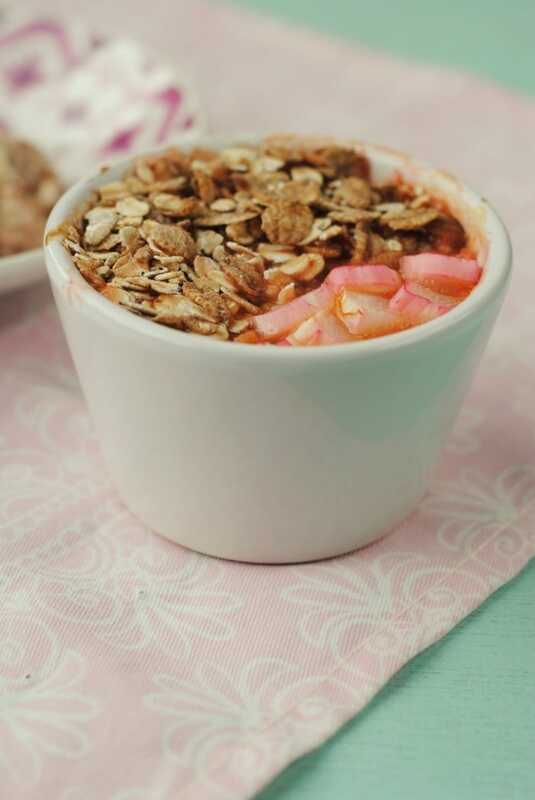 I have such happy memories of arriving at my Nan and Grandad’s house and smelling a rhubarb crumble cooking away in their oven – make with rhubarb they had lovingly grown themselves. We really try to make an effort to eat as seasonally as possible in our house (although we are no perfect with this, as I eat berries all year round) and right now we are in rhubarb season in the UK. So not only is this a nostalgic British dish, but it is also a seasonal one. Speaking of British (as us Brits like to do often). this recipe comes from Stoves challenging me to come up with a classic British recipe to celebrate Mother’s Day. 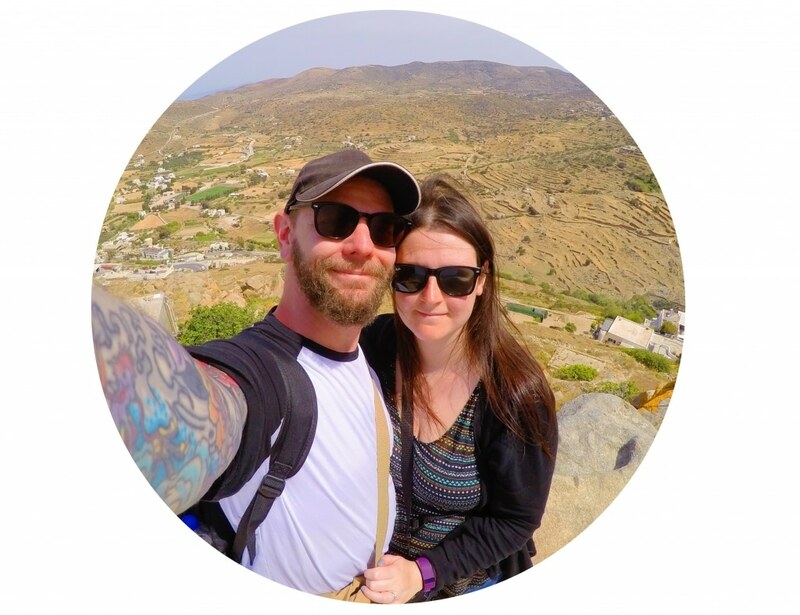 Stoves are proud to make all of their cooking appliances right here in Britain, which I love, and all their products are made with attention to detail, with small teams working solely on one product. If you want to get a bit of kitchen inspiration, or you just want to dream about your ideal kitchen, then I recommend you look at their Range Cookers – I have my eye on the purple one! These desserts are low in calories and low in fat by themselves, but we served ours with some salted caramel ice cream because, well, I don’t think I need to justify that, do I? It’s also really good with custard too. 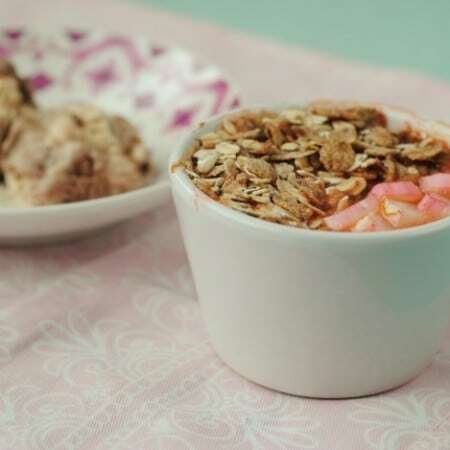 In a bowl, mix together the rhubarb, orange juice and honey and divide between 2 small ramekins. Put the oats on top and then put in a preheated oven at 190C for 20 minutes. I do like the sharpness of it, just not too much. Ya know I don’t think I’ve ever made rhubarb before! 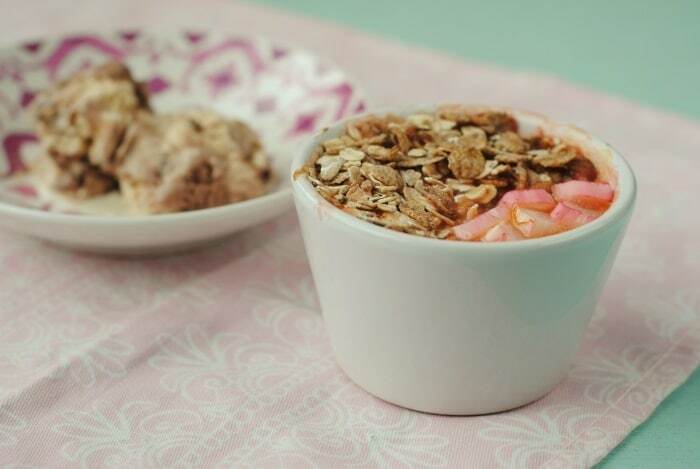 I love desserts made with honey + oats. It’s such a comforting dessert. Happy leap day to you too David! Rhubarb comes out in the States during pie season. Then everyone is on board! But it would be phenomenal in a crisp, too. This looks fantastic! I do have a soft spot for pie though! I miss rhubarb. Sometimes a few limp stalks are on our supermarket shelves but they are overpriced and way past their best. As children we used to eat it raw dipped into some sugar. Lovely recipe – brought back many memories too. I have never tried rhubarb before. Is the taste similar to anything else? No, it doesn’t really taste like anything else. It does have quite a bitter taste to it. I haven’t had rhubarb crumble since I was a child, but this this bringing back some happy memories for me. I will look out for rhubarb on my next shop. It’s in season at the moment, so make the most of it. I can’t wait to grow some this year. Me too! It’s just trying to find the room for it in our garden. 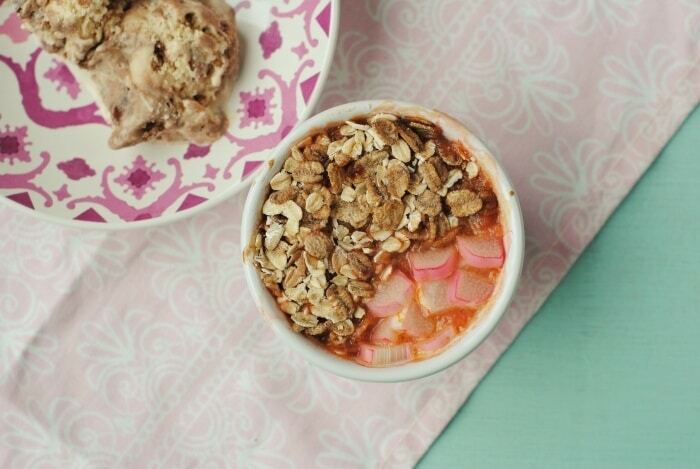 I love love love rhubarb. I am lucky to have a free supply from my parent’s neighbour who grows it but doesn’t like the stuff himself. My crumble topping has to be the traditional Scottish way though with oats, flour, sugar, butter and a little salt. I realise this isn’t quite the low calorie dish you were aiming for lol, but it has to be for me. That’s probably why you are lovely and slim and I am definitely not. I like your addition of orange juice and honey, I’ll have to give that a go. Beautiful looking dish Dannii and nice alternative. Stumbled, pinned and yummed. Thanks for sharing in Jac! He grows it but doesn’t like it? I guess that is good for you! Our rhubarb in the garden will start coming up soonish (which means I can try your recipe out). You have to try it. The bitterness to it is really nice. I have never attempted making anything with rhubarb, but I am always intrigued when I see them in the store!! This looks so good. I’ve never tried to cook with rhubarb before! Clearly I need to give it a try. This dessert looks easy and delicious! It makes a really comforting dessert.